Like the folksinger Woody Guthrie, Simon-Nicolas-Henri Linguet was born on Bastille Day, the day (July 14) when the French celebrate the storming of the Bastille. Like Guthrie, too, the lawyer-turned-journalist Linguet eloquently protested injustice. 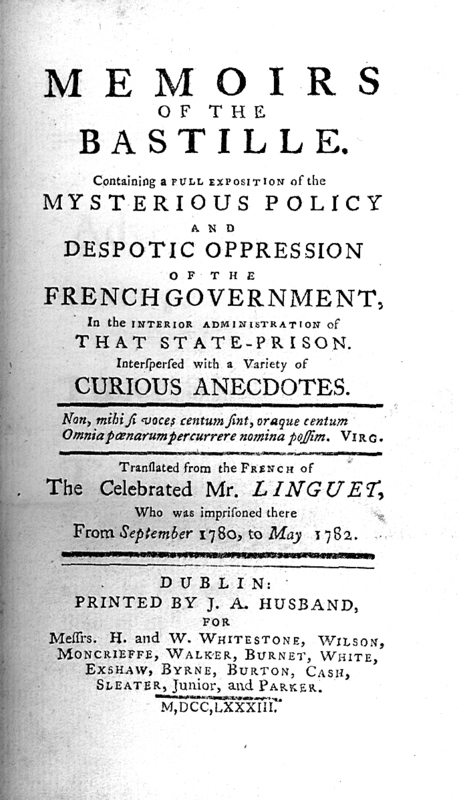 Unlike Guthrie, Linguet had been in the Bastille, and, with this book, may have helped bring it down. This was not the first book to offer a peek inside that notorious prison. Though few who left the place wrote about it, over two centuries other accounts had been published. At the start of the century, Renneville in particular had, like Linguet, immediately fled to England and written a book about his experience. Others had described the prison in their memoirs. But in 1783, when this work first appeared, France was in ferment and closer than most knew to a revolution. The French king had just helped the American colonists win their independence. Absolute power was going out of style. Nor had Linguet been just any prisoner, or just any writer. He was personally famous (or infamous), but more importantly he was the editor of one of the most eagerly read periodicals of the times. He first published this work there, which in itself assured that it would be widely read. Linguet dared tell all, and his Memoir of the Bastille contributed more than a little to the destruction of this fortress. He wrote it in 1782, only seven years before the first days of the revolution. Already signs warned of the storm; already a crowd of readers welcomed, with a greedy curiosity, reproaches, accusations and even outrages heaped upon authority. The true facts which Linguet's Memoir contains strengthened enlightened spirits in the desire to obtain from the powers-that-be themselves, concessions now necessary to the people's happiness: the declamations and the calumnies which this Memoir contains provoked the most audacious enterprises from men who were only too ready to destroy rather than reform. Linguet, by the fears he spread, the wishes he expressed, the works which his own inspired, accustomed people to the idea of overthrowing the Bastille. It was already conquered and destroyed in public opinion when the 14th of July arrived. If you have heard of Simon-Nicolas-Henri Linguet at all, you probably know more about eighteenth-century France than is common. Even then, you might barely know his name, or only know him as someone who quarreled with a more illustrious figure; perhaps a playwright whose plays (unlike Linguet's) are still read, or a philosopher whose ideas (unlike Linguet's) are still studied, or an historian whose histories, (unlike Linguet's)… You get the picture. Who would believe today that this man, wiped from history, filled Europe with his name, with the racket of his speech, his writings and his adventures? Who would believe that Voltaire dealt with him as an equal, that he was a god for Louis XVI, and the devil for his ministers, whom he never ceased to trouble; that he had held in check the Parliament, the Bar, the French Academy, the economic clan and all the leaders of philosophy; that, with immense success, he founded political journalism; that he was, in a word, one of the most talked about figures of the XVIII century? When he wrote the present work, he was forty-six, and one of Europe's most famous journalists. He was at the height of his success, a success prompted by one of his greatest failures: as a lawyer. The success of this work was the high-point of Linguet's career. He was to have more adventures: he was made a noble by the (Austrian, not French) king; he offered his services as Louis XVI's lawyer; he became a mayor under the Revolution. But let us move past these and other tales to his life's tragic-comic end. Despite the part played by this work in a key event of the Revolution, Linguet had written on so many subjects in so provocative a manner that he could be - and was - accused of holding anti-Revolutionary positions. As it happens, he was sick when he was arrested and was soon transferred to a hospital, where he might have stayed quietly out of harm's way. Instead, he once more wrote provocative letters, these to the Revolutionary tribunal, and demanded to be tried. Did he think his old eloquence as a lawyer would clear his name? If so, he had a sadly idealistic view of these summary courts. He was convicted and at once sent to the guillotine. Grumbling once again, it seems, about how unfairly he'd been treated. This work was wanting to the nomenclature of real State-Crimes; that is, of the sacrifices made by Despotism to the passions of its agents. The Author, Mr. LINGUET, was for ten years one of the most distinguished Counselors of the Parliament of Paris. He shone equally in oratory and composition. It has been remarked, that of a hundred and thirty Causes, all of them important, in which he had engaged during that period, he lost only nine. His enemies attribute this unparalleled success to the charms of his eloquence;his more candid judges, to the delicacy which directed him in the choice of his suits. Whilst Mr. Linguet was thus displaying his useful and active talents at the Bar, he employed himself likewise in the cultivation of Polite Literature, and Philosophy. The boldness of his principles, the novelty of his views, and too great a freedom in his examination of the systems established and the facts prevailing in France, made him powerful enemies, even in the Ministry, in that Country, where as it is well known, there is at least as much cabal and party spirit as in our own; with this difference, that in England the objects are great, and the means public; whereas in France parties are formed and embittered for trifles, and mystery presides over intrigue. 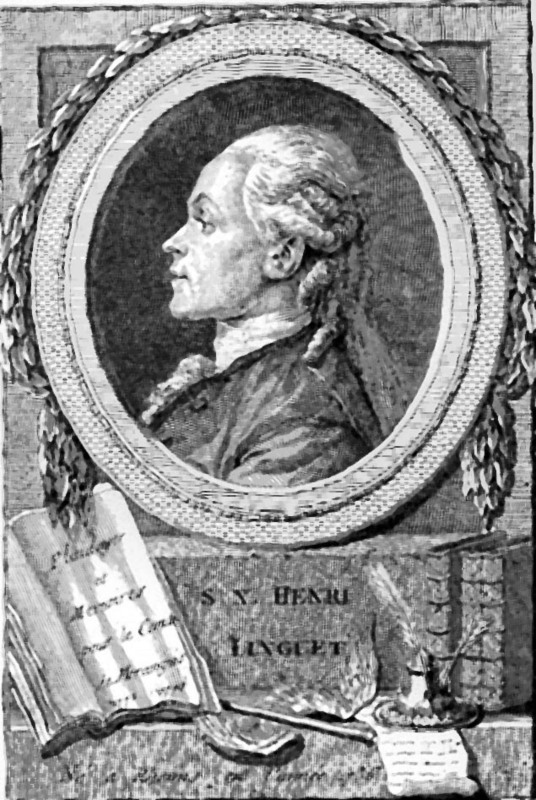 At the approach of the rupture between England and France, Mr. Linguet, having quitted the former, through a patriotic delicacy which has been been regretted, though not censured, by the English; and having persuaded himself, that on the parole of the-Count de Vergennes he might go to France to prosecute his interests there; he was arrested, on the 27th of September 1780, by virtue of a Lettre-de-cachet, and conducted to the Bastille, where he remained full twenty months. This work contains the history of his imprisonment, that of the proceedings of those Ministers who have been accomplices in it, and a description of the regimen of that infernal institution equally celebrated and dreaded, but at the same time as little known as it is formidable. I am now in England: it is necessary to prove that my return hither has been a measure absolutely indispensable. - I am no longer at the Bastille,: it is necessary to prove that I never deserved to be there. It is necessary to do more: to demonstrate that none have ever deserved it: the innocent, because they are innocent; the guilty, because they ought not to be convicted, judged, and punished, but according to the laws, and because at the Bastille none of the laws are observed, or rather they are all violated; because there are no tortures, unless perhaps in the infernal regions, which will bear to be set in competition with those of the Bastille; and because, if the institution itself may in certain cases admit of justification, it is impossible, in any case whatever, to justify the regimen of it. - It is necessary to show that this regimen, no less disgraceful than cruel, is equally repugnant to all the principles of justice, and humanity, to the manners of the Nation, to the mildness which characterizes the Royal House of France, and especially to the goodness, the equity of the Sovereign who at present fills the throne.